I made a very daring decision sunday morning, largely influenced by the fact that there was a Say Yes to the Dress marathon on, combined with a fresh issue of Food Network Magazine in-hand. That decision was to send my new roomie, also known as my fiancé, on a solo mission to the grocery store. I thought I would be safe considering he woke up and declared he was going to make Sunday dinner - his specialty: Chicken Cacciatore. Obviously if he's cooking, he can handle the shopping, right? Wrong. Turns out, Mike cannot be trusted at the grocery store. There is truly no telling what he will bring back. First of all, he completely overlooked some vital ingredients of his signature dish. Then, not only did he return with enough food to feed an army, but also splurged on a cheesecake, a loaf of artisan bread, a pound of scallops, and a bouquet of flowers. Ok, so I forgive him for these delightful luxury purchases, but my waistline and our wallet can only handle so much of Mike's shopping skills! Fortunately, out of Mike's excessive grocery shopping came this recipe. 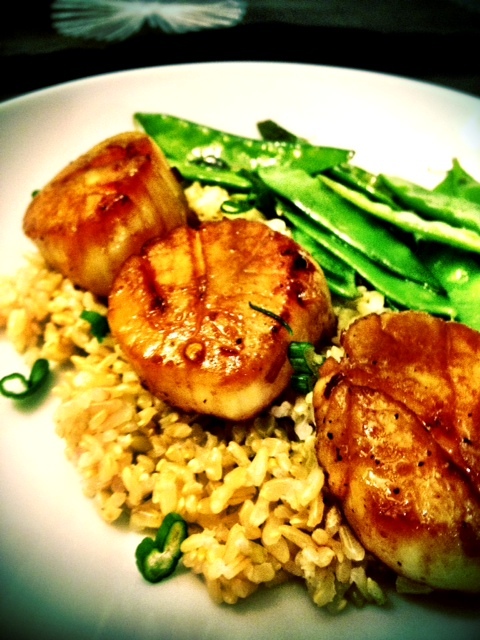 Scallops could not be simpler to prepare; it only takes a few turns in a skillet to achieve a beautiful golden sear. I served these scallops for dinner with brown rice and snow peas, but they would make a quick and elegant appetizer as well. To prepare the sauce, heat sesame oil over medium heat in a small skillet. Add garlic and sauté 1 minute. Add the remaining ingredients and whisk well to combine. Reduce heat to medium-low and simmer, whisking often. Meanwhile, coat scallops very lightly with brown sugar (this will help them caramelize). Heat olive oil in a skillet to medium high and add scallops, working in batches if necessary not to overcrowd the pan. Let the scallops caramelize on one side before flipping. Once the scallops are seared, reduce heat to medium low and cover the pan loosely with tin foil for 2 minutes or so until the scallops are cooked through. Serve warm with ginger sauce. Yum, I can't wait to try this recipe. I'm obsessed with scallops!